Lichens are NOT A DISEASE and do not harm any plants on which they are found. Their inclusion here is to answer an often-asked question as to whether they are damaging or if they have killed a tree or shrub. After all they grow just as well on stone and concrete. 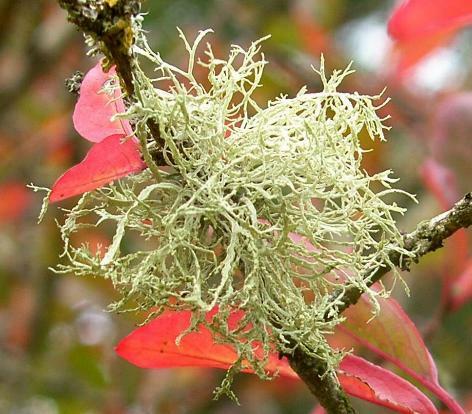 Slow-growing branches where they are found may be old, have died or are performing poorly because something else has weakened the plant which has sparse foliage allowing light to reach the lichen. There is a possibility that they could harbour pests, so may not be so welcome on fruit trees. It is estimated that there are about 30,000 different lichens worldwide and about 2,000 in the British Isles, growing on many different substrates. They are used by people finding their way by Natural Navigation by observing where they are growing. The fruiticose or shrubby lichens with grey-green hues tend to grow on the Northerly side of rocks and trees, whereas whiter or orange crustose forms grow on the Southerly side. Lichens do not stay around if the air quality is poor and have only returned to our cities since 'Clean Air' legislation led to a reduction in the amount of pollution. Having said that some can survive in extreme environments from the cold of the Arctic to hot deserts and on toxic waste heaps. There are a few that can be unwelcome in the garden. 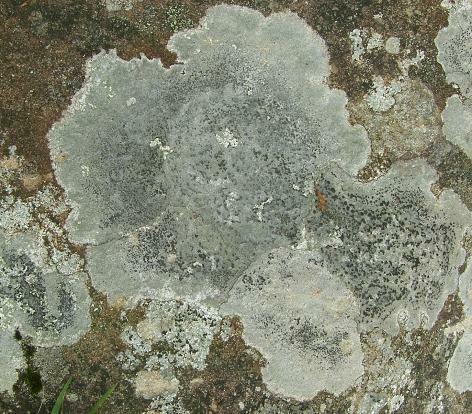 The Dog Lichen is a foliose form that grows in poorly growing grass and the crustose forms such as Lecanora rupicola grows as white patches on roof tiles, paving and tarmac which are extremely difficult to remove. They can be desirable on statuary and containers to give them signs of age. A crustose Lichen growing on a boulder. Yellow Lichen on a south facing branch. Lichens are made up of a two, sometimes three, organisms living in a symbiotic relationship, a fungus which cannot photosynthesize and a green alga or a cyanobacterium which can. The fungus provides support and increases the surface area to capture moisture and minerals for both partners to use. Although they can be separated and cultured in a laboratory, neither can survive as individuals in nature. They live for a long time and some have been determined as 4,500 years old. The fungus forms the majority of the structure, usually around 80%, and the alga can be as low as 5%. 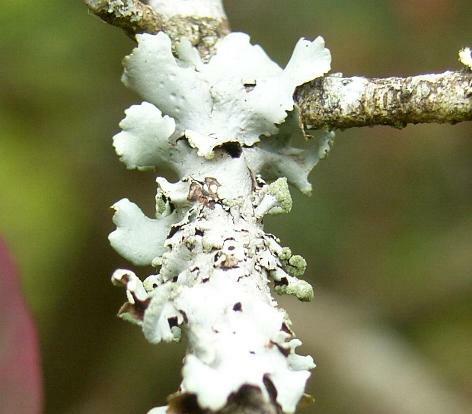 The presence of two or three distinct species in one organism has caused some dispute in the past over their classification, but it is now accepted that they 'lichenized fungi' so are placed in the Fungi Kingdom. The naming of Lichens falls to the fungal partner or mycobiont - the alga or bacterium is known as the photobiont. The general structure of the body or thallus has an upper, protective cortex made up of fungal threads or hyphae. Below this the photobiont is held on the same structures and a looser formation of the hyphae make up the medulla below this which allow air to circulate and storage of the sugars produced by photosynthesis. A lower protective cortex is present in some forms. There are four main forms in which they grow: Crustose lichens form a crust which clings close to the substrate where it grows. Foliose or leaf-like lichens have a distinct upper and lower surface and can have root-like structures to anchor them to the substrate. Fruiticose or shrubby lichens do not have distinct upper and lower surfaces, but have lobes or branches. Squamulose lichens are made up of tiny scales which do not have a lower cortex. A green foliose form such as Melanelixia fuliginosa has a thallus which is very similar to Liverwort, but grows on trees and in much drier conditions. 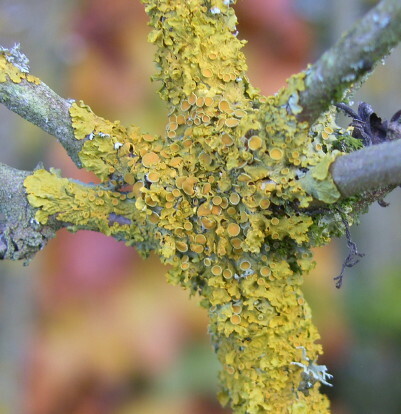 The yellow lichen Xanthoria parietina found on trees, contains chemicals which are being researched as a treatment for leukemia.